Efficient large-scale manufacturing became possible whilst military and aviation operations have also become more advanced. Thanks to technological advancements, it opened up opportunities for innovation and dynamic strategies. Likewise, this also provided industry key players with a competitive edge through further optimisation of their operations. But, as higher demand and more stringent regulations shape the manufacturing and military industries, operatives must find the right computing solutions. Therefore, it is essential to have a rugged computing system at the centre of operations. So, this can provide an easy access to operatives and creates an ergonomic workspace for seamless task execution. In addition, many of these industries also use large machinery in conjunction with panel PCs. Work areas need to be managed to have an ample space for machines without losing any computing equipment. Hence, building an industrial workstation is suitable for heavy-duty operations. With its compact footprint, panel PCs can be easily set up with rugged peripherals for a robust computing system. And as a result, these computing devices can be utilised even at the core of every operation. 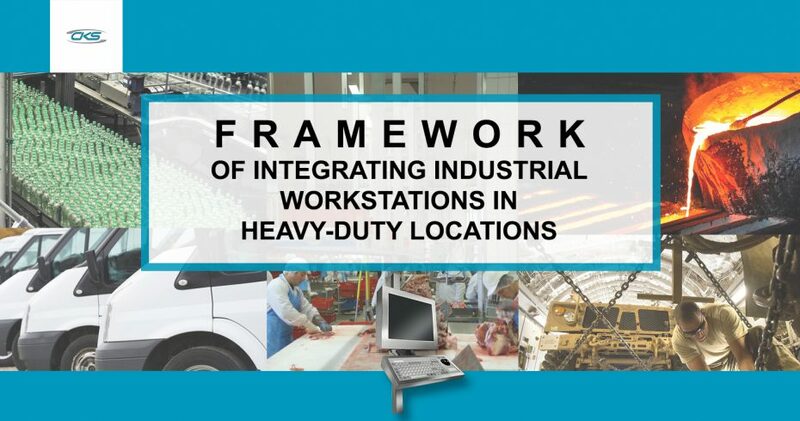 Read more on this blog and find out why setting up industrial workstations is best for heavy-duty locations. An ergonomically-designed workplace is an ideal industrial setting. Workflow can be more seamless so there is a possibility of an increase in the production rate. One effective way to bring in the most compatible devices to an operation is by building an industrial-grade workstation. It is an all-in-one platform where panel PCs and its peripherals can be installed. It is made of stainless steel to ensure that it can last in an environment where damaging elements are present. To ensure that panel PCs can be easily mounted, this rugged workstation is also compliant to VESA mounting standards. This type of workstation has a robust construction frame with the highest degree of protection for a device. Rest assured that all devices installed are kept safe from any potential risk available during operations. Food and beverage manufacturing in the UK contribute £28.8bn to the economy wherein food represents 20% of all consumer spending. It is no wonder why this industry bears a fast-paced environment, which also requires seamless operations. The UK food and beverage sector produce a variety of products: from seafood, meat, baked goods, dairy to ready meals. In fact, meat processing, preservation and production are the largest in this industry, accounting to £15.9bn in 2015. Not only that, the UK is also the second largest exporter of beverages around the world. Whilst, seafood and meat exports account for more than $1.15 billion each in 2016. With this real numbers in the industry, automating production lines is a must. This is to increase the production rate whilst reducing the waste to improve sustainability. Upcoming trends in the UK food processing industry include the consumer’s demand for healthier food and better waste management. Given that the UK has a strong reputation for high-quality food standards, manufacturers must continue to be compliant to these standards whilst being able to cater to the market demand. Another challenge in this industry is to create an ergonomic workspace for computing equipment. As the industry moves toward automation, it is essential that work areas are organised. Moreover, having a computing system at the core of operations provide many advantages such as easier access to computing functions for a streamlined production. Ergonomics is crucial in industrial workplaces to reduce bottlenecks caused by movement difficulties when executing a task. Having VESA-compliant workstation, integrating panel PCs and its peripherals can be easy to set up. Thus, food processors may have the capability to speed up its operators because the computing system is within the reach. So, it improves productivity. Food safety standards are definitely rigorous in food processing. So, it requires a system that can function well in food production. Now, the industrial workstation has a stainless steel (304) construction. This type of steel is used in workplaces requiring food sanitation due to its corrosion-resistant quality. Food processing facilities have harsh working conditions such as extreme temperature, dirt, moisture and other food by-products. But, our workstation has an IP65/NEMA4 rating to ensure that it can last under these conditions. So, expect that it can definitely last over an extended period of time. Warehouses and storage facilities are built for distribution and logistics management. These are the places where products are kept for deployment to different wholesale and retail markets. But, one of the most common issues is that facilities tend to run out of space. Bulks of inventory need to be managed and at the same time, it requires an effective warehousing system. UK’s distribution and logistics sector have been using different types of technology to optimise operations and manage large amounts of data. But, many stakeholders are focusing on operational efficiency to reduce costs. So, they opt for better operational visibility that can effectively monitor how the network supply chain is performing. Warehouse capacity is now becoming a concern for distribution and logistics companies. Several facilities are resorting to renting smaller, more expensive units to cope with the overflow of inventory. There is also a need for innovative solutions in the supply chain. For example, transportation management software is used to track goods in real-time, provide dynamic scheduling and many others. As the industry faces the challenge of workspace shortage, the importance of ergonomic workspaces is being brought into the light. To complement the use of warehousing management software, it is advantageous to use industrial PC workstations. Our workstation is built to efficiently save space so that panel PCs can be used even in limited work areas. With its 2M high stainless steel pedestal, it provides a compact footprint for a robust computing system. Check out more of its specifications below. In a distribution and logistics facility, items of different sizes and weight can take up a huge amount of space. Since our workstation is VESA-compliant, standard PC enclosures can be installed to this equipment. So, it can save workspaces to give way to larger machinery and other items. It is also important that panel PCs can be easily integrated into operations to further improve workflow and minimise downtime. But, this workstation is built with a plug and play concept. Standard PC enclosures and peripherals can be easily installed to this workstation. Thus, it can be easily implemented into different logistics operations. The fulfilment floor in distribution and logistics companies bears a fast-paced working environment. But, there should be no room for errors due to the strict schedule requirement to avoid downtime due to equipment failure. Our ruggedised workstation has an IP65/NEMA4 rating to withstand extreme conditions. As a result, there will be continuing operations and any unexpected equipment failure is avoided. Definitely, UK’s approach to military logistics is quite innovative, allowing them to achieve high standards in terms of efficiency and responsiveness. Ways to optimise satellite communications, as well as network management, are integrated into their system. But, certain circumstances that military should utilise an equipment to improve computing functions in military operations. Today, digital trends are making an impact in military logistics. Due to the importance of analysing data to become useful in decision-making, sensors and analytics are utilised. This made condition-based maintenance (CBM) possible to create a more cost-effective and more efficient repair and maintenance. Military logistics have now evolved from simply managing equipment and manpower. The onset of the digital age allowed for condition-based, predictive maintenance to ensure an efficient mission readiness. Personnel involved in military logistics are always deployed in areas where there is extreme temperature, humidity, shock, vibration, dirt and moisture. Although there are many technological advancements that are commercially available, these could not adhere to the military’s harsh environment. Amongst the most recommended systems are those with rugged performance abilities and compact footprint. A rugged computing system that only takes up a small area is the most advisable solution to address this challenge. Utilising an industrial-grade workstation in the military is the best computing solution. It comes with an ergonomic design and panel PCs can be build up easily including its system accessories. Military logistics entails a fast-paced, harsh working environment. So, there is a need to have ruggedised computing components that it can withstand these conditions. But, our industrial workstation has an IP65/NEMA4 protection rating. This means that it has the highest level of protection against dust, water intrusion and other potential risks present in the military. Hence, logistic operators can utilise its computing devices on workstations in full throttle even in the different working environment. Military logistics stations may have limited workspaces due to the presence of larger equipment and items. With that in mind, a VESA-compliant workstation is needed so that standard PC enclosures can be easily installed. This feature can also save workspace whilst keeping all PC peripherals in one compact footprint. Military logisticians can also take advantage of our workstation’s plug and play or ready-to-install feature. Standard PC enclosures and peripherals can be easily set up. So, it is a ready-to-use equipment for military applications. Steel is definitely one of the most in-demand materials in many sectors. Industries such as the construction, transportation, energy, packaging and appliance greatly rely on this product. Its different forms offer a multitude of properties to cater to a wide range of applications. According to the World Steel Association, the global demand for finished steel will grow by 1.8% to more than 1.616 billion mt (metric tonnes) in 2018. And in 2019, it is expected to increase by another 0.7% to nearly 1.627 billion mt. Automation is one of the widely used technology in this industry for efficient production rate. Steel producers will be able to increase their output without any quality loss. As a matter of fact, it is even utilised to create specific steel variants that may otherwise be difficult to mass produce. Given that there is going to be an increased demand for steel, steel processing facilities also have extreme working conditions to consider. This includes conditions such as extreme temperature, humidity, dirt, shock and vibration. Moreover, steel production implements different industrial applications. Some sectors would require specific steel types for their product. That is why stakeholders are finding ways to dynamically produce a vast range of steel forms. Having installed an industrial computer can address the existing challenges in steel applications. But, building it up with a stainless steel workstation can be the key solution to high-quality steel production. An industrial PC workstation provides the steel operators with a convenient access to robust computing functions. In steel-manufacturing facilities, the production floor may have a limited workspace for computing systems. But, this rugged workstation features a 2M-high stainless steel pedestal. It can only take up a small footprint to set up a robust panel PC and its peripherals. So, it frees up more space for larger machinery used in steel production. Steel production facilities have an extreme temperature, dirt, humidity, shock and vibration that can harm a commercial-grade computer. Fortunately, our workstation has an IP65/NEMA4 protection rating to assure users that it can last under harsh conditions. So, it prevents the possibilities of operational downtime due to hardware failure. Easy installation of computing equipment in steel production comes handy with an industrial workstation. Its VESA-compliant capabilities offer standard PC enclosures and peripherals can be installed to this workstation effortlessly. It expedites the process of restarting a steel-making operation for an optimised production. As the technology continues to evolve, it is a crucial factor to use this advanced equipment to improve industrial operations. But, it is also a great advantage to create an ergonomic workspace to ensure an efficient and dynamic workflow. By using industrial workstations with built-in panel PCs and its peripherals, any industrial applications can now be optimised to centralise computing functions. Call (+44) 01438 747111 today and start building your own industrial workstation.